Eight years, 25,000 km and more than 10,000 photographs: these are the figures behind the exhibition “Architecture and Landscape in Norway” by photographer Ken Schluchtmann, currently open in the Felleshus of the Nordic Embassies in Berlin. 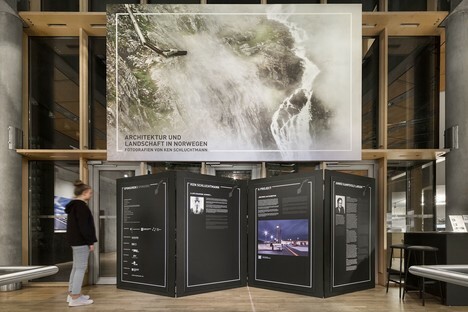 The exhibition which opened on 5 October 2018, during European Photography Month, includes a selection of Ken Schluchtmann’s photographs illustrating the German photographer’s deep connection with Norway and its landscapes combining nature with architecture. It all began back in 1997, when Ken Schluchtmann turned his life around and began a new career as a professional photographer after a trip to Norway. Ken Schluchtmann’s photographs focus on the 18 National Scenic Routes of Norway, landscape itineraries running along the country’s coastlines and fjords, where works of art or architecture underline the marvels of the country’s natural landscape. This national project for the promotion of tourism, which began in 1994 and is still underway, includes 250 rest stops and viewpoints designed by about 60 architectural studios, landscape architects, designers and artists, due to be completed by 2024. Ken Schluchtmann is the only professional photographer to have consistently, systematically documented the Norwegian Scenic Routes so far. His powerful images illustrate some of the country’s most beautiful and significant landscapes, images in which the natural element is underlined by the presence of - and the contrast with – great works of art and architecture. Berlin’s Felleshus, the entrance to the complex containing the embassies of five Nordic nations, Denmark, Iceland, Finland, Norway and Sweden, hosts a site-specific exhibition which is part multimedia. Big outdoor banners (11x4m and 8x2m) on the building’s walls attract the attention of passers-by and invite them into the Felleshus of the Nordic Embassies, where the architecture and landscapes of Norway are presented in photographs of different sizes and print types arranged in order according to the country’s National Scenic Routes. Along with the photographs, video screenings, animations and big stones that Ken Schluchtmann has brought home from Norway over the years help visitors experience the landscapes of Norway. The installation for the Felleshus exhibition was designed by Ken Schluchtmann in collaboration with the Berlin creative agency Bluescope. 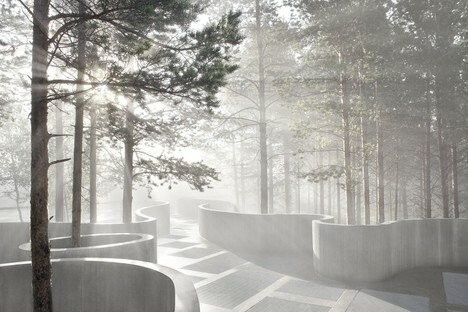 The underlying concept was to take the public into Norway’s impervious, imposing landscape with all their senses; the architects implemented a series of expedients such as oversized prints that make the viewer feel small before the spectacle of nature. 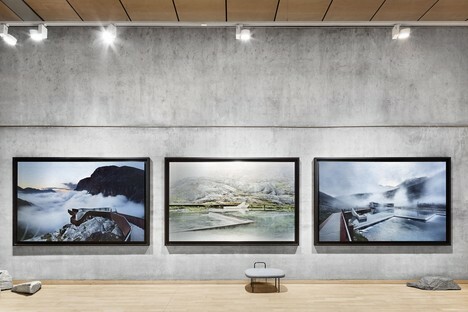 They used the Felleshus itself as an active element in the exhibition concept, installing exhibition areas on different levels and underlining the materials the building is made of, such as bare concrete, glass, wood and metal, which visitors can easily see in the buildings photographed in Norway. A Making Of video that visitors can watch either in the auditorium or on the first floor introduces them to the exhibition. 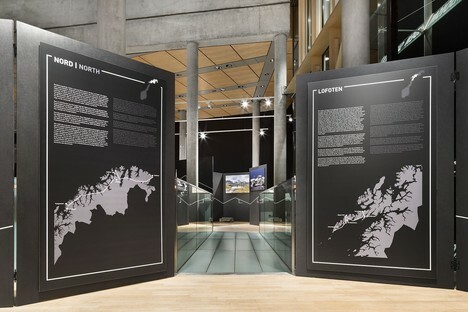 Also on the first floor is a Video Map of Norway showing the itinerary which, accompanied by the words of Norwegian exhibition curator Janike Kampevold Larsen, covers the 2 metre high black panels on which the photographs are displayed. These vertical partitions define the exhibition route, gradually revealing new perspectives and views and permitting total immersion in the marvellous landscape and architecture of Norway.